As silly as that may sound, if you were to look in the mirror would you be satisfied with the color of your teeth? If you are, then I suppose congratulations are in order. But if not, have no fear! Obtaining a whiter smile is easier now than ever before thanks to recent improvements in dental technology for professional teeth whitening. This new technology presents patients with several options to choose from when obtaining that coveted white smile, all of which can be received and applied at your own convenience and is one of the most cost effective cosmetic dentistry options. There are three primary solutions offered to patients looking for professional teeth whitening. These solutions come in the form of user friendly take-home whitening kits, which provide you with the necessary means to whiten and ultimately improve your smile. While all of the available professional teeth whitening treatments are somewhat similar, there are certain differences between them that are important to understand as well. Basic teeth whitening trays are typically available at many of your neighborhood pharmacies and convenience stores. While these over the counter, daily usage trays are moderately priced and easily accessible, they present a number of risks and potential issues. These given drawbacks in addition to the general inconvenience caused by the required 3 to 4 hour minimal wearing time, often cause dentists to suggest that their patients seek a professional teeth whitening treatment, in which the dentist can provide assistance. 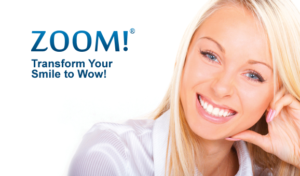 The Zoom whitening system is a revolutionary new product offered by Philips Oral Healthcare. It is quickly becoming one of the highest requested professional teeth whitening products by dental patients nationwide. Unlike the previously mentioned over the counter treatments, Zoom whitening is a professional teeth whitening treatment that is exclusively available at your dentist’s office. In selecting the Phillips Zoom treatment, you will receive a custom-fitted whitening tray provided by your dentist, as well as a touch-up kit and take-home formula. Professional Teeth Whitening … The time is now! With numerous options available, if you desire a whiter smile there is certainly no reason not to have one. Consult your dentist and ask what professional teeth whitening treatment might be right for you. Remember, your smile is your best accessory! If you are interested in learning more about professional teeth whitening options, schedule your consultation with Dr. Charles R. Kimes at Overland Park Dentistry. Dr. Kimes will help you explore your options for a personalized Hollywood smile, so you can make an educated decision about the best option for you. Our south office can be reached at (913) 647-8700 and our north office at (913) 341-2380.